What a meaningful way for the youth of our congregation to serve our Lord! Each year the 7th and 8th graders serve as acolytes. The word acolyte is derived from the Greek word acolytos, meaning companion, attendant, or helper. In many Christian denominations, an acolyte is anyone who performs ceremonial duties such as lighting altar candles. After the 8th graders graduate, the 6th grade class is trained in May to start in June of that year, joining with the graduated 7th graders, now 8th graders. The church has an outline of clothes to wear, which candles to light in correct order, etc. The students usually serve every other weekend, but may be more during Lent and/or Advent seasons. Greeters: Our 'welcoming committee' for new and current members attending our services. They always have a friendly smile and are ready to answer any questions visitors may have. be prepared to answer any questions a visitor may have (location of bathrooms, 'kid kits', audio and visual helps, sympathy and get-well card signing, etc. Greeters receive a schedule for several months and will always have the same service time which they can choose to best fit their personal needs. You can, of course, vary the service times as well. The Wedding Consultant will work together with the Pastor, assisting the bride and groom to make their wedding a joyous occasion. You will be giving of your time and talent by showing Christian love here at St. Paul's. It is our intention to help with the rehearsal and wedding ceremony so that all runs smoothly. This will be a fun experience for you and your help will be greatly appreciated by the bridal party and families. You will receive guidance from the Pastor and the Wedding Coordinator. Each couple will initially meet with Pastor. They will have been given a copy of "Guidelines For The Marriage Ceremony At St. Paul's" and "The Wedding Information Packet" along with other information. These will be made available to you. One or two Wedding Consultants will be assigned to a wedding depending on the size of the wedding party. The Altar Guild Cares for the church sanctuary and prepares it for each service. We work in teams of 2 people. A team is scheduled for an entire weekend. Each team schedules its own time to get things done. A directress is appointed by the Pastor and works with him on any special instructions. It involves about one hour of preparation on Saturday morning to get t everything ready. We have one group meeting each year. Contact the church office for answers to any questions. The elders are an essential part of the church's ministry, working closely with the pastor(s) in all aspects of the spiritual life of the church. They see to it that services are conducted regularly and in good order. They assist the pastor(s) with worship, baptisms, communion, reception of new members and in visiting the sick and homebound. They also assist the pastor(s) in contacting members who have been negligent in their church attendance and in their attendance at the Lord's Table to receive Christ's Body and Blood in Holy Communion, to the end that they may be brought back to a right relationship with their Lord and the church. The ministry of ushering is a vital part of our church ministry. Ushers represent the church in a very visible way, conveying friendliness and hospitality to worshipers, helping to set the tone in preparation for the worship service and contributing to the orderliness of the service. An usher crew typically serves at regular church services once every third week and more infrequently at special services during the week, such as at Lenten and Advent services. All usher crews share in serving at these special services. If you would like to serve your Lord and share His love at St. Paul's with your fellow members and guests as part of this important ministry or would just like more information about ushering at St. Paul's, please contact Dale Pipkorn, chairperson of the ushers, or the church office (414-541-6250). St. Paul's Choir is a service organization dedicated primarily to the music ministry of the church. Membership is open to all confirmed members of the congregation. Rehearsals are held weekly from September to the end of May. Rehearsals are normally on Thursday evenings. 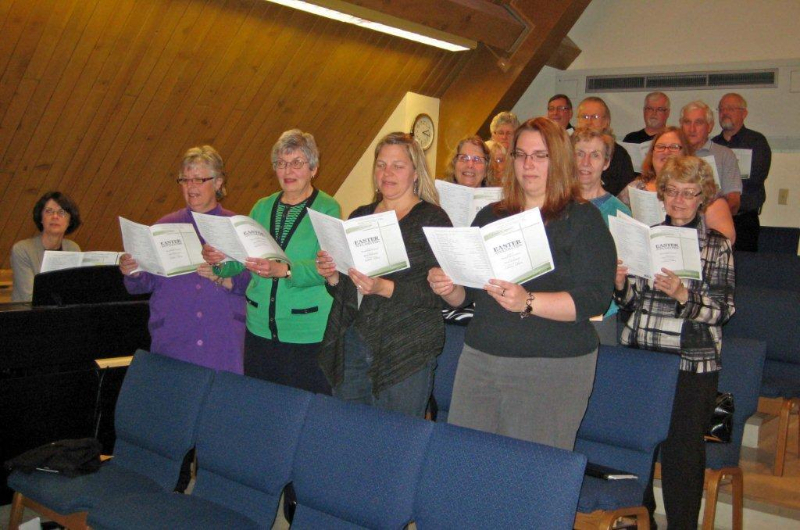 The choir participates in the church services on a regularly scheduled basis, sharing a message through song. Several times during the year, congregation members, who otherwise cannot commit themselves to a year-long involvement, are encouraged to join us. We encourage this participation especially during various holiday seasons such as Christmas and Easter. Please note that no auditions are held, and if you are interested in joining the choir or need further information, please contact the church office (414-541-6250), any choir member or Nancy Hoelke, Director. 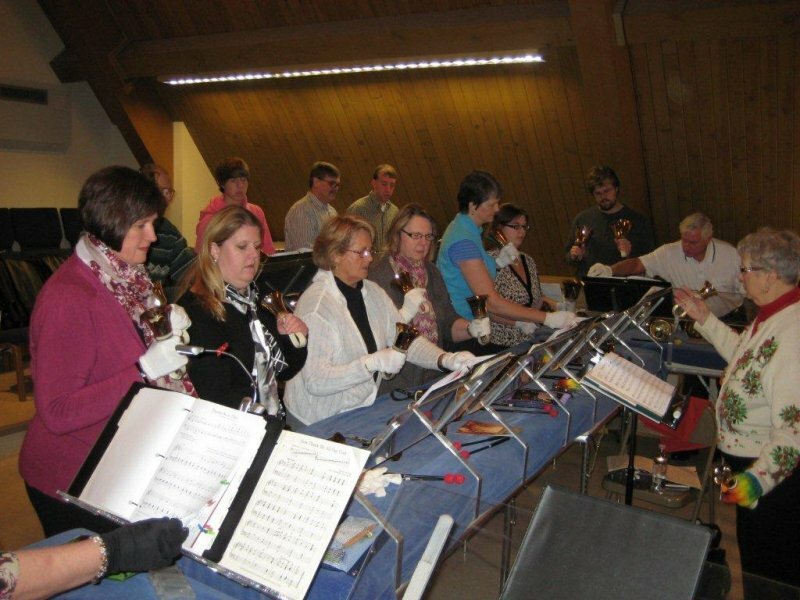 The Handbell Choir rings joy into our worship service once or twice a month as well as holiday services. This choir occasionally performs at special events in the area. Rehearsals are held weekly from September through May in the church balcony on Thursdays from 6:00 to 7:15 p.m.
Our Praise Band Group normally rehearses (meets) in the church on the Tuesdays prior to the 2nd and 4th Sunday of the month at 7:00pm. Check the church calendar to confirm schedule. Join us as we participate in our 10:30 a.m. worship services on the 2nd & 4th Sundays of each month. Contact the church office (414-541-6250) for more information. The puppet ministry shares the message of God’s love. The puppets are used for children’s messages and other special celebrations of the congregation. The group welcomes anyone interested in being a puppeteer. Those without experience will be offered training. Rehearsals are held shortly before the service or event. For more information, please contact Pastor Stanton or Laurel Privatt through the church office (414) 541-6250. Compact discs and cassette tapes of the Saturday worship service are available. Call the church office at 414-541-6250 to request a CD or tape. St. Paul’s Radio Ministry has been an ongoing mission arm of St. Paul’s Lutheran Church since 1972. Currently, each 5:00 p.m. Saturday service is recorded and broadcast over Radio Station JOY 1340 AM, and 98.7 FM, 15 hours later at 8:00 a.m. every Sunday morning. Our goal is to reach as many people as possible in S.E. Wisconsin with the Gospel message. The broadcast also serves as a wonderful ministry to homebound members and those who are unable to attend due to hospitalization and recovery, work schedules, etc. A number of home bound members tell us that the radio broadcast is an important remaining connection to St. Paul’s for them. Others use the broadcast to hear again or review the service they may have already attended the night before. 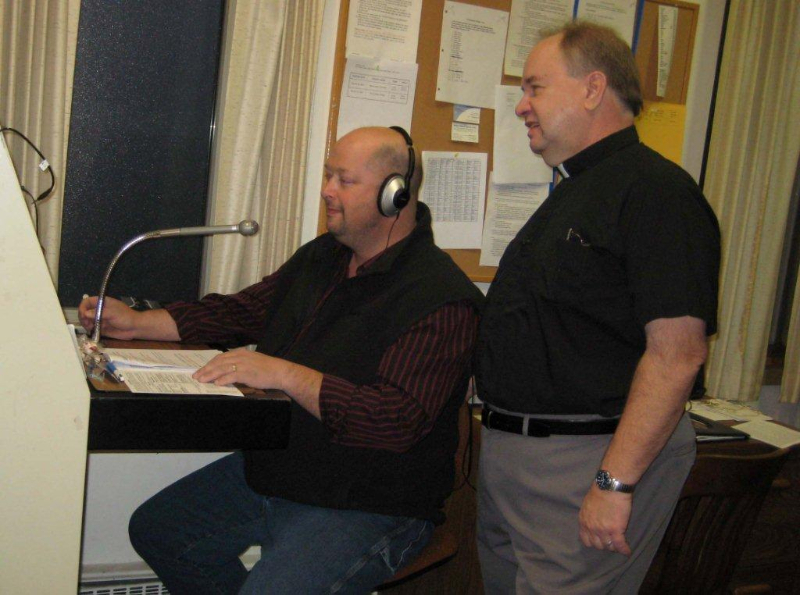 This Radio Ministry is not a part of St. Paul’s Lutheran Church budget but relies entirely upon donations and prayers from individual church members and listeners (including non-members who listen to the radio service). It may be supported through separate donations, through memorials given in honor of loved ones who have passed away, or from individual or group radio sponsors. A broadcast may be sponsored by underwriting the air time cost of one broadcast in honor of a family member or friend, to celebrate a special occasion such as a birthday or wedding anniversary, in thanks for blessings received, to honor the memory of a loved one who has gone on to eternal rest, or as a gift or remembrance during a special season. Contact the church office (414-541-6250) for the current cost of a broadcast. Write a check to St. Paul's Lutheran Church with "Radio Fund" written in the "Memo" portion of the check. mailing the check to St. Paul's Lutheran Church, 7821 W. Lincoln Ave., West Allis, WI 53219. The Sunday 8:00 A.M. radio broadcast may also be heard via the radio station’s website, Joy1340.com, if an internet connection or wireless is available. Click the “Listen Live” box and hear the broadcast, wherever you are. Call the church office if you need more information regarding the broadcast. Audio cassette tapes and CD copies of services are also available by calling the church office. We welcome your inquiries, gifts, and prayers as we use this radio ministry outreach to help spread God’s Word. Thank you for your support of our Radio Ministry!